Icons is back, guys, for a week-long look at one of the greatest characters ever to grace the screen… Santa Claus! Plot: Shortly before Macy’s Thanksgiving Day Parade, a charming man calling himself Kris Kringle (Edmund Gwenn) discovers the Santa Claus Macy hired has arrived stone cold drunk. Horrified, he reports the problem to parade organizer Doris Walker (Maureen O’Hara), who in desperation hires Kris to take his place. Kris turns out to be a huge hit, and he is offered the job as Macy’s store Santa for the Christmas season. Single mom Doris returns home to find her daughter Susan (Natalie Wood) watching the parade with their neighbor, lawyer Fred Gailey (John Payne). Fred tries to bond with Susan over fairy tales, but Doris has raised the girl to be strictly pragmatic, not believing in such foolishness as giants or Santa Claus. Kris turns the store upside-down when a child requests a toy Macy’s is sold out of, and he tells the boy’s mother which competitor still has some in stock. When word reaches toy manager Julian Shellhammer (Philip Tonge), he’s briefly outraged until he realizes the goodwill Kris is generating is turning the parents into loyal customers. In fact, everyone starts to fall for Kris’s charms – even the stoic Susan is stunned when she overhears him speaking Dutch to a lonely child who is new to America. Doris asks him to explain to Susan that he’s merely an employee, but he surprises her by insisting that he is, in fact, the real Santa Claus. Shocked, she’s about to fire him, until R.H. Macy (Harry Antrim) congratulates her on the “new policy” of redirecting customers to other stores. Still nervous about his stability, she arranges for him to be examined by the store therapist, Mr. Sawyer (Porter Hall). Sawyer is the only person not taken in by Kris’s charm, immediately deciding the kind old man is potentially dangerous. Macy’s policy of directing customers to other stores becomes so popular that competitors begin following suit, and Kris takes advantage of his proximity to the Walker girls to continue bonding with Susan, hoping to convince both of them of the reality of Santa Claus. He gets enraged, though, when he finds out that Sawyer has been analyzing his friend Alfred (Alvin Greenman), loading him with nonsense about hating his father and guilt complexes. He angrily confronts Sawyer, striking the therapist with an umbrella. He’s played straight into Sawyer’s hands, giving him the opportunity to paint him as dangerous and forcing him into a competency hearing. Fred Gailey quits his law firm in order to represent Kris, and the trial becomes front page news. The Judge (Gene Lockhart) finds himself walking a thin line, not wanting to be the man to rule there is no Santa Claus in an election year, and Fred cleverly makes the District Attorney admit that Santa exists. The trial now rests on his ability to prove that Kris, himself, is the legitimate Santa Claus. He brings in one character witness after another, even Mr. Macy, to testify on Kris’s behalf. Things dangle precipitously in the air, though, until a pair of mail clerks see a letter addressed to Santa Claus at the courthouse (from one Susan Walker, who is writing to tell him she believes in him now). The clerks see an opportunity to dump the mountains of Santa Claus mail in their dead letter office, and send them all to Kris Kringle. In a magnificent finale, Fred argues that if the United States Post Office – a department of the Federal Government – recognizes that Kris Kringle is Santa Claus, the courts must do so as well. The judge agrees and Kris is set free. On Christmas morning, at a party at the home where Kris lives, Susan is disappointed that she doesn’t see a sign of the present she asked for, and her faith in Kris is shattered. Kris gives Fred directions on a “shortcut” home, and on the way, Susan spots her present: a house she saw in a magazine. And, as Fred notes to Doris, it’s for sale. As they look at the house, they find Kris’s cane leaning in the corner, and Fred has to question if he really was such a fantastic lawyer after all. 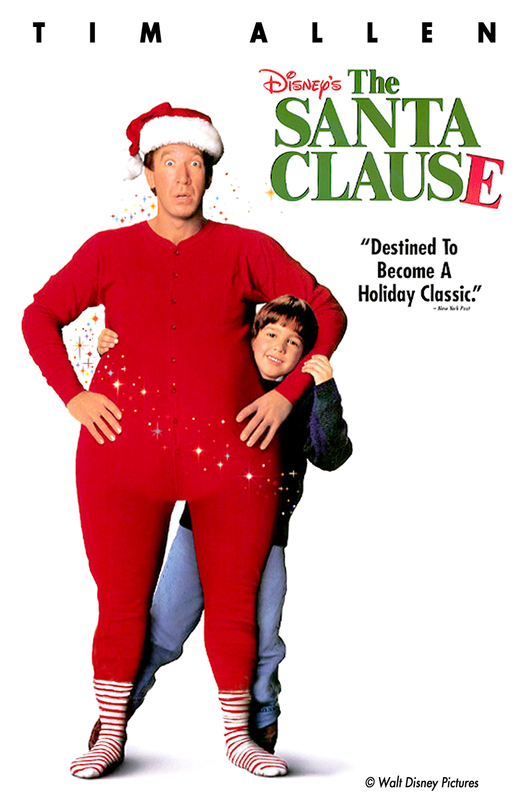 Thoughts: I couldn’t possibly spend a week talking about Santa Claus in the movies without starting here, the quintessential performance of the character. 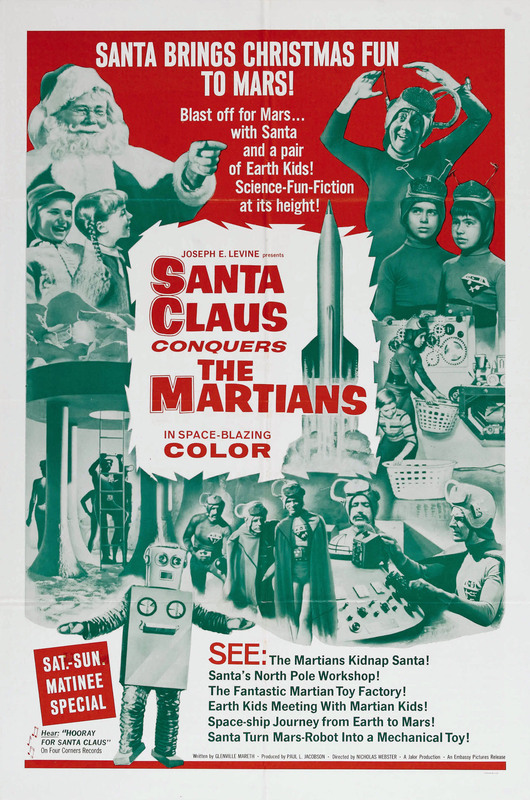 Perhaps the most amazing thing about it, though, is that the movie is couched in such a fashion that you’re not supposed to be entirely certain if Kris really is Santa Claus or if he’s just a sweet-hearted lunatic. Obviously, with nearly 70 years of loving the film behind us, I think most people have taken it to heart that Kris was legitimate, that the magic he brings to the role is all real, but that doesn’t mean it was intended that way, that’s part of the baggage we’ve assigned to the film over the years. It’s earned baggage, though, earned by Edmund Gwenn and his flawless performance. Gwenn has a timeless quality about him. He’d be perfectly suitable in a Santa story set in Victorian England or modern America, but he made Christmas in New York circa 1947 an extraordinary place. He relishes every moment in the role, whether suited up in red or walking down the street in a topcoat. (Speaking of red, do the world a favor and don’t watch the colorized version of this. It’s an abomination on to Rudolph. Stick with the glorious black and white.) He won an Oscar for this part, as best supporting actor, although I find it hard to imagine he wasn’t up for lead. The film, incidentally, also won “best writing, original story” and “best writing, screenplay,” and was nominated for best picture, losing to Gentleman’s Agreement. You guys have all seen Gentleman’s Agreement, right? Show of hands? That’s what I thought. 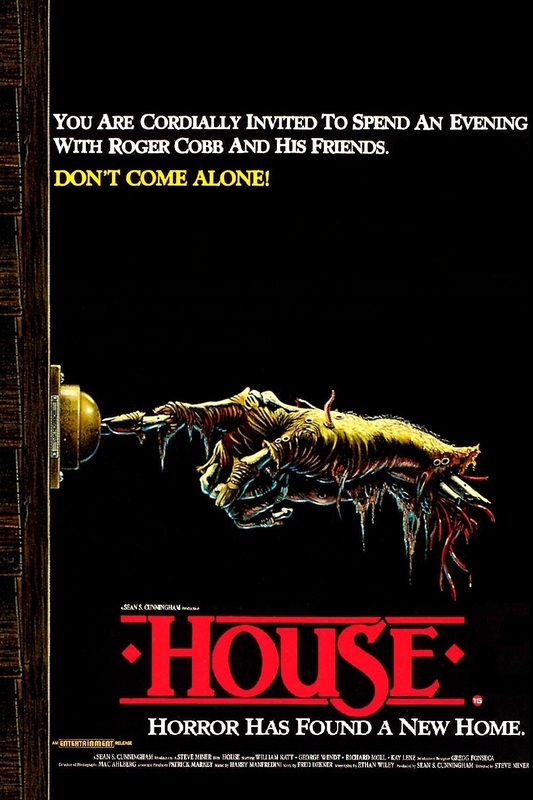 A word, if I may, about the history of this movie. 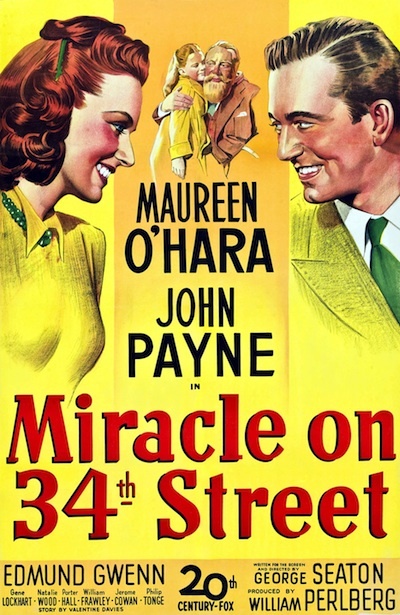 When it was released in 1947, it actually came out in May, and the marketing did its best to hide the fact that it was a movie about Santa Claus, instead trying to make it appear like a simple romantic comedy about O’Hara and Payne’s characters. Word has it the studio head was convinced that more people see movies during the summer, and didn’t want to wait until the holidays to release it. It just goes to show you that short-sighted movie executives are nothing new. The film would have been moderately successful as a romcom, I suppose, but can you possibly imagine it having the longevity or cultural impact it did if it wasn’t a Christmas movie? 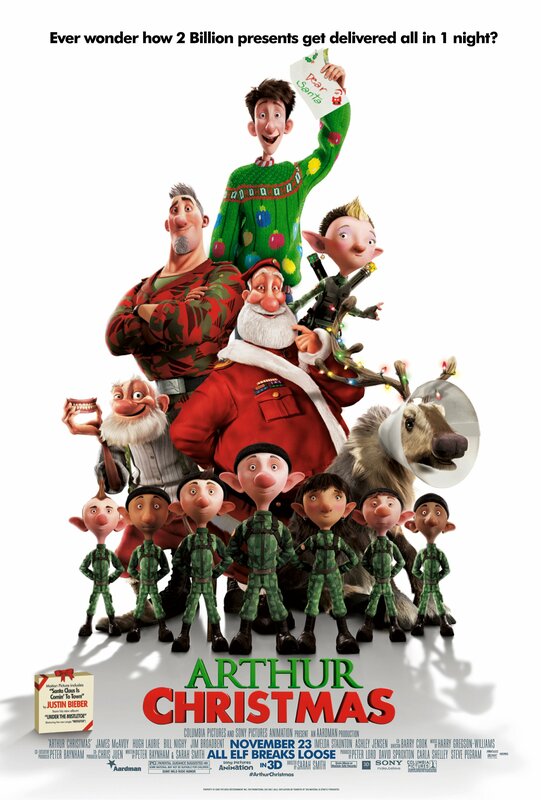 Hell, can you even imagine what the plot would be without Kris Kringle? A May release? It’s practically insane. The rest of the cast is very good, though. Maureen O’Hara and John Payne are a classic screen couple, with the kind of old fashioned glamour that you just don’t see in movies these days. Modern audiences may want to assign some sort of creepy attitude towards Gailey – he does, by his own admittance, start to befriend Susan in an effort to win over Doris – but he never comes across as inappropriate or sleazy. What’s more, the chemistry between Payne and young Natalie Wood is one of the high points of the film. There’s a sort of frustration that comes along with his attempts to convince the child that Santa Claus is real, and that’s something a lot of adults struggle with as the world their kids grow up in gets more and more cynical. It rings very true, very honest. The bit players are fantastic too. Porter Hall as the nasty Mr. Sawyer is the closest thing the film has to an antagonist, and he sells the part solidly. Jerome Cowan as the District Attorney gets some really plum scenes, such as the one where his own son is called to testify to establish that even he has admitted Santa Claus exists. Gene Lockhart as the judge helps carry the film to its conclusion, and I Love Lucy’s William Frawley as the Judge’s campaign manager brings a touch of modern politics that keeps the film from becoming too saccharine. This movie has been remade from time to time, including a particularly famous remake in 1994 starring the great Richard Attenborough, but nothing comes close to the sweetness and joy of the original. (And, to be honest, I simply can’t forgive them for the way they changed the absolutely perfect ending.) Accept no substitutes this Christmas, friends – stick with the original. Plot: Momus Alexander Morgus (Sid Noel), a mad scientist living above the Old City Ice House in New Orleans, is working on his latest project: curing an ailing artist (John Ferdon) of his sniffles with a little old-fashioned brain surgery. As Morgus and his assistant, a mute hangman named Chopsley (Thomas George) attempt to work wonders on his newest patient, reporter Pencils McCane (Dan Barton) is drowning his sorrows in a dance club. Pencils recently turned in a story about Morgus and his “girlfriend,” Zelda, but nobody at the newspaper believed him. Morgus’s latest invention is a machine that can turn a person into dust, then restore them to life, and Pencils is determined to get the story. Pencils persuades Morgus to take him back to see Zelda again – a beautiful young woman who has been kept in a hypnotic trance for years, preserving her youth eternally. (Because hypnosis does that, you see – stops the aging process. What, you didn’t know that? And you call yourself a scientist.) Morgus informs Pencils that he and Zelda will be married soon, and offers as proof the large diamond fused directly to her finger. Roaming the Ice House, Pencils uncovers Morgus’s new machine, and gets him to demonstrate its use on a cat. It seems to work, but the white cat Clyde comes out black and smaller on the other side. Pencils submits Morgus’s machine to a United Nations Science Symposium, where a Microvanian national, Bruno (David Kleinberger) learns of it and sees the potential to use it to smuggle spies into the United States. They send a beautiful blond spy, Mona Speckla (Jeanne Teslof) to New Orleans to try to pry the secret from Morgus. Meanwhile, the Doctor is knee-deep in “wedding plans.” Mona convinces first Pencils, then Morgus to join her on the way to the “science symposium” – really a ploy by the Micorvanians. Really, you know they’re going to be evil from the outset based entirely on the ridiculous accent they speak in. Morgus cheerfully begins condensing a squad of Microvanians for them, dumping their powdered remains into a box. Mona, meanwhile, has fallen for Pencils, and wants to defect from Microvania. Thoughts: Every city in America (or at least every city worth visiting) at one time or another had a late-night creepshow movie host: Vampira, Svengoolie, and Elvira are immortal names, and wherever you are, you can probably recall your own local celebrity of the night. In the New Orleans area, where I grew up, our late night host was Morgus the Magnificent, a mad scientist whose experiments served as the framing sequence for that week’s movie. 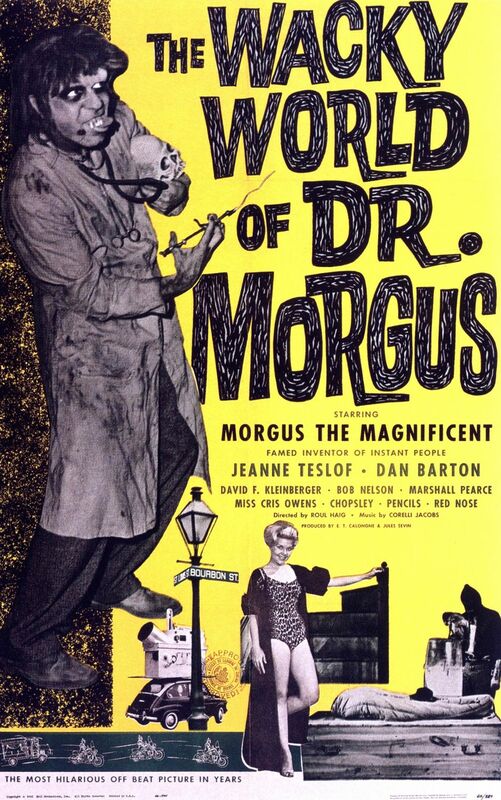 Morgus ran from the 50s through the 80s, with reruns on the air as recently as 2011, and all horror-loving children of Nola have a deep affection for Morgus, and still consider ourselves members of the Higher Order. When a local company got the rights a few years ago to produce a DVD of Dr. Morgus’s feature film debut (also his final feature film), I had to snap it up. Finally, “Freaky Firsts” gave me the perfect excuse to finally watch it. As one of those kids, this movie won me over almost immediately. Although it was interesting to see Morgus outside of his comfortable home in the Old City Ice House, seeing him traipsing about the city of New Orleans, taking him outside of the set where we’d watched him for such a long time, made the film a bit more special. Granted, much of the film (at least the parts where Morgus actually appears) feels like an extended episode of his TV show. The opening sequence, where he hopes to cure a painter’s stuffy nose by cutting into his brain, is straight out of the late night antics he got up to throughout my childhood. I’m really rather sorry that Erin was at work when I watched this, because it’s hard for me to tell if this movie would be genuinely entertaining to anybody who didn’t grow up watching Morgus, or if it’s mostly my affection for the character that made watching it so much fun. As far as that invention goes, it’s an absolutely ludicrous idea, but the way it works and the fact that it’s actually used in conjunction with a United Nations science symposium can’t help but make me think of The 1966 Batman: The Movie, in which Batman’s foes use a nearly identical device for a similar purpose to that planned by the Microvanians in this movie. It’s almost too close to accept as mere coincidence, and one has to wonder if screenwriter Lorenzo Semple Jr. ever spent any time in New Orleans. The overall story, on the other hand, is truly scattershot. The subplot with Zelda, for example, is utterly extraneous, adding nothing to the film but time. (It is, to be fair, a pretty quick film – just 83 minutes.) The prologue sequence with the ailing artist and his stuffy nose is an interesting introduction to Morgus, but has nothing to do with the rest of the events of the film. Even the parts that are directly related to the plot, the Microvanian invasion and the powder machine, are loosely knit together at best. There’s no real logic behind Pencils having anything to do with the United Nation Science Symposium, for example, but there you are. Even though the film is branded as a horror/comedy, there’s really nothing horrific about it once you get past Morgus’s makeup and the particularly creepy relationship with Zelda. 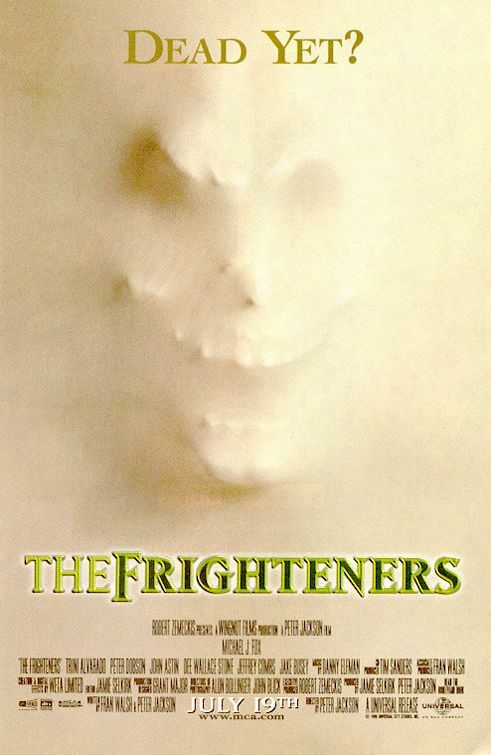 This is far more Munsters than The Frighteners. Sid Noel as Dr. Morgus is frankly the only standout in a particularly bland cast. Oh, Bruno has a little bombast in him, but nothing that will stay with you for any period of time. Noel, however, has his usual bizarre allure as Morgus. He’s weird, even a little hideous, but for all his buck teeth and bug eyes, something about him remains absolutely delightful. I don’t often spend a lot of time talking about the quality of a particular film print here, because I’m mostly about digging out the story and the characters, and frankly, the quality might vary from one print or one transfer to another. But in the case of The Wacky World of Dr. Morgus, I’m going to make an exception. The film was restored as much as possible, but there are still plenty of lines and artifacts on the screen, and somehow, that just makes it all the more charming. It helps with the time capsule quality of the whole experience. It really does bring back the feeling of sitting back late at night and watching an old Universal Monster picture, or some 50s Roger Corman cheesefest. I had a lot of fun watching this film, but like I said, I can’t be sure if that’s because it’s actually good, or merely because I love the good Doctor. But in truth, does it really matter? Granted, I can’t transfer my experience over to you, but one of the things I set out to examine when I began my first Reel to Reel project was the way our experiences influence the way we take in story. For the brief 83 minutes of this project’s run time, my experiences helped make me very happy, and that’s never a bad thing.